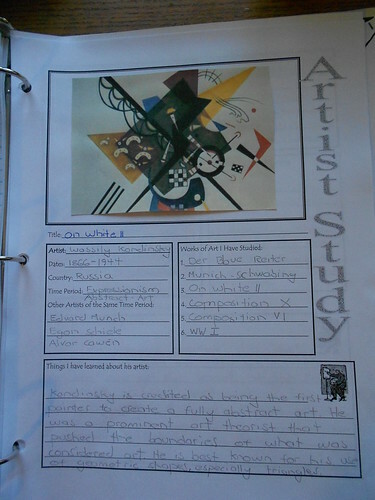 I use notebooking pages as part of my high school art appreciation course, as a record of my sons’ learning and as a tool to help them gather information and build a better understanding of how artists fit together. Not only does it help them retain information and make their learning more meaningful, it is enjoyable to look back and see how much we have accomplished in the past four years. 1. Pick an overall time period or art movement. 2. Pick three or four artists within that art time period or movement. 3. Pick artwork from each artist to study using picture study methods. 4. Research and write a biography for each artist. 5. Research and write about the art period or movement. 6. 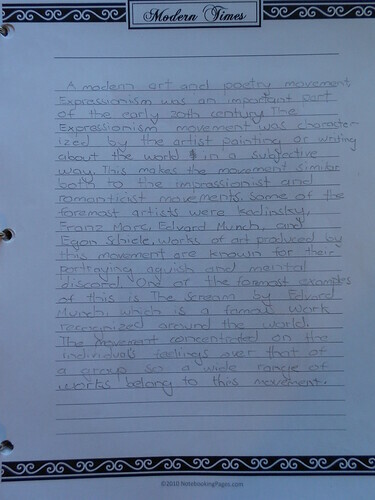 Write a few paragraphs with your opinion of the artist or art movement. Everything gets filed in the Timeline Notebook or in the Art Notebook. Here are the steps illustrated from our notebooks. Please note that the plans featured in this post are free for you to download from the Harmony Fine Arts website. Of course, you can design your own personalized course using art time periods, art movements, and artists that interest you and your family. Harmony Fine Arts is just one idea…I love simple things and the plans I offer will give you a base to work from if you just don’t have the time to build your own plans. 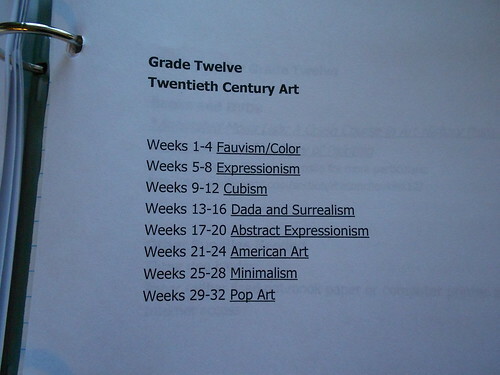 Step 1: We are studying 20th Century history this year so my Grade 12 plans from Harmony Fine Arts are a perfect fit. Harmony Fine Arts Grade 12 Art Plans – Free download on my website. Step 2 and 3: Here is an example showing the artists I offer within a specific time period or art movement. My son reads the information in the assigned books, then he researches the artists using online sources. 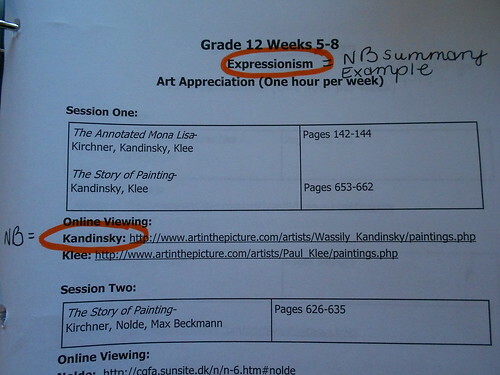 You can see with the handwritten notes that I expected three things as a follow up: summary of expressionism, an example, and a notebook page/biography for Kandinsky. This is an artist notebook page from one of my Harmony Fine Arts plans. 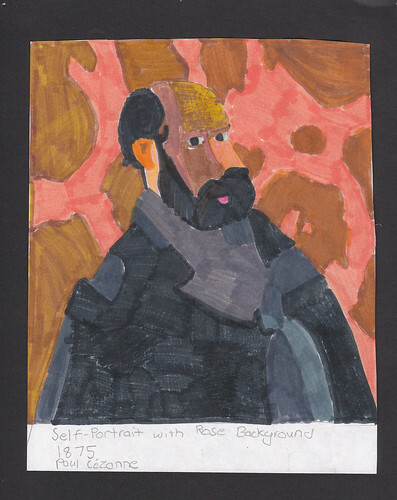 Step 4: The artist notebook page is used to record artwork viewed as part of his picture study and also some notes in preparation for a more formal written artist biography. Step 5 and 6: As part of our high school art appreciation, I require a one page summary of the art movement at the end of the four week period. My son records it on a notebook page and then files it in his history timeline notebook. I also require him to write a short opinion piece on notebook page which looks like the one above. 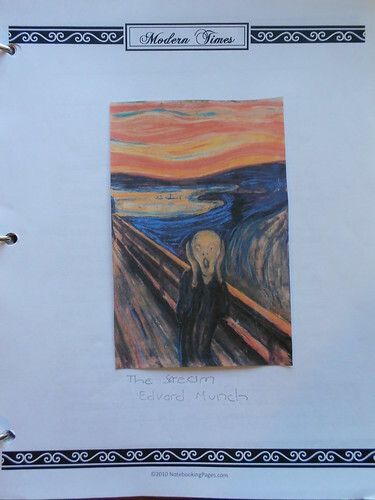 Additional follow-up can include a notebook page with an example of artwork from the timeperiod. Here is one piece from last year…I allow them to pick the subject and medium to use. Follow-up can also include an art project or making a copy of an artist’s painting. So What Do We Do After Picture Study? Please take advantage of as many of my free downloads from Harmony Fine Arts as you can in your homeschool and then share the love with others by spreading the word with your friends. Thank you for sharing. We are working on journaling a part of our learning every day. Calling it a scrapbook of sorts of where we go the next 10 weeks. It has been interesting the last week to see the differences between the boys – in their style of documenting what they want to remember, and – the choices of points of interest. When my batteries recharge I’ll show you a photo of their Winter Wonder pages. I’m learning more from them, than they are from me. I Love My Life! You make it seem simple, as well it is and should be. I always love seeing your glimpses into high school. I’m headed there.